First off they will always be 168x28 in size that cannot change lest you will ask for alignment issues with the rest of the forum. The image itself will simply be your name however we can assume that I can make it a little better, or cheap if you just want it to be complete. SO I propose different levels of quality, each more expensive than the next. What does it do: I made one for myself see? 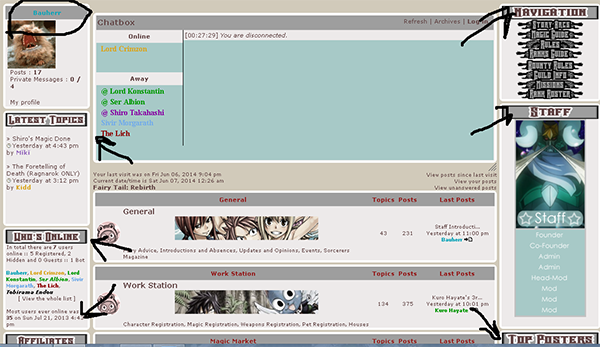 Note its rendered, and thus the background will take the same color scheme as the rest of the Forum. The color is a dull grey and black fade in boarders. It will also be written in Classic Fairy Tail Font. Cheap is what Cheap gets eh? Still rendered, but looks a lot more interesting, you can pick your colors now, the boarder colors, and your font can be customized. Neat little effects can be added like shadows and glow effects. Aite now you get a background, however small you got to work with, Ill put titles instead of names, and try to work with you on making it as badass as you like! Yessir~ Just the difference of what you got vs what you want! Im not satisfied: Talk to me, Ill see if I can fix it. Editions are free. NOTE: GETTING A USERNAME CHANGE WILL BREAK THE CODE AND THUS THE IMAGE. Lemme know if you do. So how to apply, just copy paste the code below and Ill get to you soon as possible! Username: YES you may purchase for a friend here~ I also need it exactly as printed in the widget, the coding is Case Sensitive. Type: Cheap~ Not-so-Cheap. How-do-you-call-this-cheap! Or Can I upgrade? Details: Links of images, font similarities, or images you wish to use? Other: Try to keep it quick and simple so I can understand you. Username: THUNDER THUNDER THUNDERCATS HOOOOOOOO! Details: Go crazy just try to match it with the avi/siggy maybe? Details: Whatever font goes with the site. Also shadow the text for both. Lemme know if this is okay before I Install them?